Home » Press » NEW JANM FILM SERIES KICKS OFF WITH "THE JOY LUCK CLUB"
The Joy Luck Club will kick-off Big Trouble in Little Tokyo, a new film screening series presented by the Japanese American National Museum (JANM) in partnership with Angry Asian Man, First Pond Entertainment, and Visual Communications, on Wednesday, February 11, at 7 p.m. A light reception will precede the screening at 6 p.m. and the movie will be followed by a Q&A with director Wayne Wang and others affiliated with the production. The Joy Luck Club is the 1993 film adaptation of Amy Tan’s bestselling novel of the same name. In it, a Chinese American daughter is asked to take her late mother’s place in a weekly mahjong game, where a group of immigrant women have been gathering to share their stories since immigrating to the United States following World War II. Having only a passing interest in her heritage at first, June eventually learns, along with the daughters of the three other mahjong players, to appreciate the struggles endured by the previous generation. Big Trouble in Little Tokyo will be a bi-monthly series that spotlights specially selected films by and about Asian Americans. Screenings will be followed by discussions with available cast and crew members. Following are the screening dates through 2015 and titles for the first three screenings. Big Trouble in Little China, whose title inspired that of this film series, is an action-adventure film set in San Francisco’s Chinatown. Directed by John Carpenter, it received mixed reviews when first released but has since become a cult classic. The Curse of Quon Gwon is a silent black-and-white film. It is the earliest known film directed by a Chinese American and one of the earliest directed by a woman, Marion Wong. The evening’s special guest will be Arthur Dong, a noted filmmaker who preserved two reels of The Curse, which was later restored by the Academy Film Archive. Portions of the film remain missing. 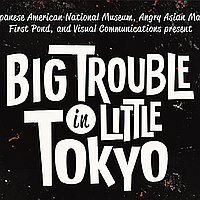 Advance tickets for The Joy Luck Club and subsequent screenings in the Big Trouble in Little Tokyo series are $8 for JANM and Visual Communications members, $10 for the general public. On the evening of the screening, tickets at the door (if available) are $12 for JANM and VC members, $15 for the general public. All screenings will take place at JANM’s Tateuchi Democracy Forum, located at 111 N. Central Ave. in Los Angeles. For more information and to purchase tickets online, visit janm.org. Incorporating hundreds of objects, documents, and photographs collected by JANM, this exhibition chronicles 130 years of Japanese American history, from the early days of the Issei pioneers through the World War II incarceration to the present. Organized as part of the global icon’s 40th-anniversary celebrations, Hello! examines the colorful history of Hello Kitty and her influence on popular culture. The exhibition includes an extensive product survey, with rare and unique items from the Sanrio archives, alongside a selection of innovative contemporary artworks inspired by Hello Kitty and her world. Hello! is a specially ticketed exhibition. Established in 1985, the Japanese American National Museum promotes understanding and appreciation of America’s ethnic and cultural diversity by sharing the Japanese American experience. Located in the historic Little Tokyo district of downtown Los Angeles, JANM is a hybrid institution that straddles traditional museum categories and strives to provide a voice for Japanese Americans as well as a forum that enables all people to explore their own heritage and culture. Since opening to the public, JANM has presented over 70 exhibitions onsite and traveled 16 of its exhibitions to locations around the world, including the Smithsonian Institution and the Ellis Island Museum in the United States, and several leading cultural museums in Japan and South America. JANM is located at 100 N. Central Ave., Los Angeles. Museum hours are Tuesday, Wednesday, Friday, Saturday, and Sunday from 11 a.m. to 5 p.m. and Thursday from noon to 8 p.m. General admission is $9 adults, $5 students and seniors, free for members and children under age five. Admission is free to everyone on Thursdays from 5 p.m. to 8 p.m. and every third Thursday of the month from noon to 8 p.m. General admission prices and free admission times may not apply to specially ticketed exhibitions. Closed Monday, 4th of July, Thanksgiving, Christmas, and New Year’s Day. For more information visit janm.org or call 213.625.0414.